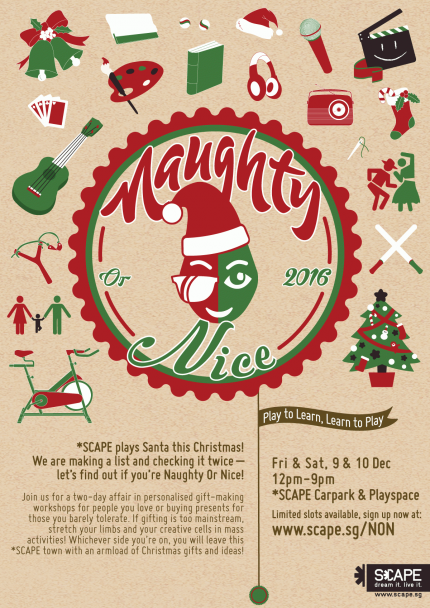 *SCAPE plays Santa this Christmas! We are making a list and checking it twice – let’s find out if you’re Naughty Or Nice! Join us for a two-day affair in personalised gift-making workshops for people you love or buying presents for those you barely tolerate. If gifting is too mainstream, stretch your limbs and your creative cells in mass activities! Whichever side you’re on, you will leave this *SCAPE town with an armload of Christmas gifts and ideas! We have a plethora of curated workshops for you to prepare exceptional gifts that will stand out from the rest. For more information about each workshop and their schedules, click on the links below. Sign up early as slots are extremely limited! Workshops are classified either NAUGHTY or NICE. You make your choice. DANCE CLASS emphasises freeplay between toddlers and grown-ups through dance and physical connection. DANCE JAM FOR ALL AGES invites dancing bodies to a space for improvised dance and movement. This December, we partner up with Cat Welfare Society to bring to your Yoga + Cats - a charity yoga fundraiser and adoption drive for our feline friends to find their forever home in this upcoming festive season. The yoga session is a pay-as-you-wish event, with a minimum recommended donation of SGD15. 100% of the proceeds will go to CWS's Second Chance Fundraiser to keep their sterilisation and community outreach projects alive into 2017. This is a bring-your-own-mat event. There are limited spots available, so register quickly by emailing us at hey@yogaplus.sg with your name, mobile number, and email address. This is a mass individual art jamming session. The activity will be unguided and participants get to paint at their own time and comfort, as they allow their creativity juices to flow. Light up! Witness 30 over saber wielders practising solo or partner drills. Santa has been kidnapped in a nefarious Elven plot! Follow the clues in your dossier, explore *SCAPE, solve the puzzles, and track down Santa's whereabouts. You'll need all your wits to also figure out how to free him from his captors and truly save Christmas!